Living Downstream, a new documentary film that has met with sold-out shows across the continent, standing ovations in major centers from Boston to Toronto, and rave reviews in media outlets such as The Washington Post, will be screened in Cobourg on Tuesday, February 22nd, 6:45 PM at the Cobourg Public Library. The film Director Chanda Chevannes will be attending the showing. Living Downstream charts the life and work of biologist, author, cancer survivor, and cancer prevention advocate, Sandra Steingraber, Ph.D. This documentary film is based on Sandra’s book of the same name, and, like the book, documents the growing body of scientific evidence that links human health with the health of our environment. Part scientific exploration, part personal journey, the film follows Sandra during a pivotal year in her life: as a biologist and author, speaking to groups across North America about cancer prevention; and as a cancer survivor, when she receives ambiguous results from a cancer screening test. The film captures this movement between the scientific and the personal, which is also a hallmark of Sandra’s work. Critics have repeatedly commented on the visual beauty of the film and its poetic persuasiveness. “Handsomely photographed and powerfully argued…an arresting portrait,” says Ann Hornaday of The Washington Post (04/23/10). The screening is being hosted by a number of local organizations and businesses including Sustainable Cobourg, Cobourg Health Food Store, and the Northumberland-Quinte West Green Party. Books and silent auction items will be for sale. All profits will be donated to the charitable organization Prevent Cancer Now. This entry was posted in Health, News 2011, Uncategorized and tagged cancer, documentary, event, film. Bookmark the permalink. 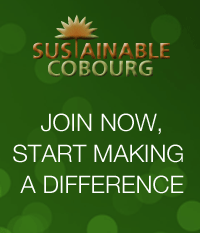 Fellow Facebook-using Sustainable Cobourgers – please share this with your Facebook friends.